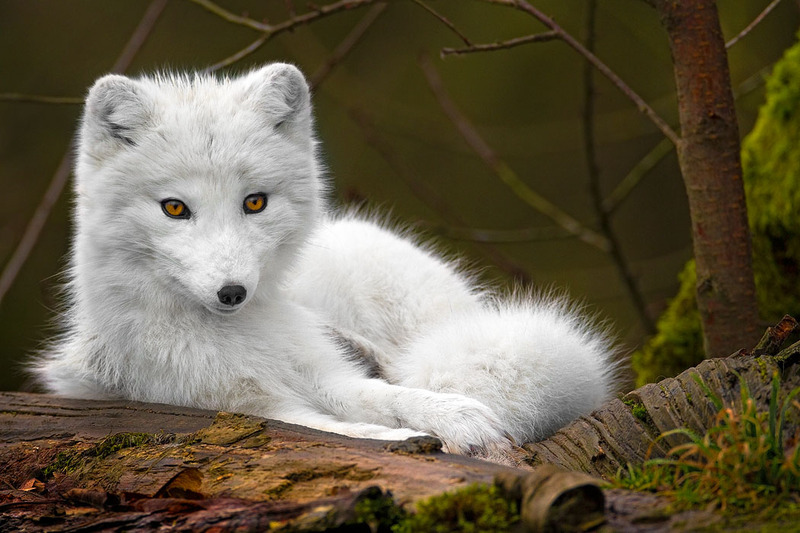 The Arctic Fox (Alopex lagopus) is well-suited to its native climate, with a lush coat that seasonally changes colors for blending into their terrain. Summer months, their coat is generally dark gray and brown, allowing for camouflage while stalking prey. However, in the wintery months, their luxurious fur becomes the snowy white coat that gives them their name. Their fur-covered soles, short noses, small ears, thick fur and long bushy tails help them survive in frigid and harsh arctic climates. Their nomadic habits keep them on the move from place to place, always in search of food. They typically live in burrows, or dens, where the female each spring has a litter of six, to as many as 25, pups. Within their family groups of a male, one or two females and the kits, the second female is often a leftover kit from the year before that does not breed, but helps care for the young.